The Next Chapter listener Sherry Ainscough suggests a Canadian companion to Nicholas Sparks's 1996 romance novel. The romance novel The Notebook by Nicholas Sparks was first published in 1996 and was later adapted into a popular film starring Ryan Gosling and Rachel McAdams. The Next Chapter listener Sherry Ainscough from Red Deer, Alta. says if you liked this love story, you should try reading Things To Do When It's Raining by Canadian author Marissa Stapley. 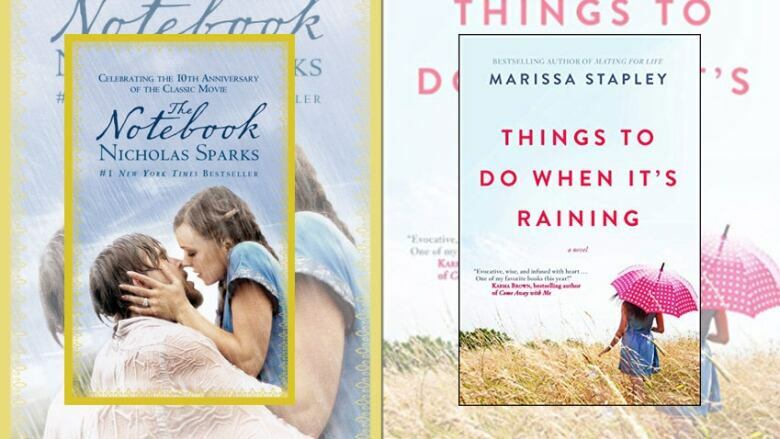 "If you like The Notebook by Nicholas Sparks you will love Things To Do When It's Raining by Canadian author Marissa Stapley. In The Notebook, the story centres around Noah and Allie and their forbidden love for each other. In Things To Do When It's Raining, the story also centres around a love story, but this time it's between Mae and Gabriel. They have a forced separation when they're teenagers and their lives are set on a different paths. When circumstances change, Mae and Gabriel are each pulled back to Alexandria Bay where they lived. They start to unravel the mystery that has kept them apart for all these years. In each of the stories, their families have created roadblocks that have kept them apart. "Things to Do When It's Raining is a beautifully told story. It settles first love, second chances and family secrets. It was the kind of story that I just couldn't keep waiting. I just read it in two sittings." Sherry Ainscough's comments have been edited for length and clarity. Atticus the poet has over one million followers on Instagram. What inspires his poetry?